KEY WEST, Florida, November 30, 2010 (ENS) – Boaters will not be allowed to discharge sewage into any waters of the Florida Keys National Marine Sanctuary, under a new federal rule from the National Oceanic and Atmospheric Administration, NOAA. Vessel sewage discharge has been prohibited in the state waters of the sanctuary since its designation as a No Discharge Zone by the U.S. Environmental Protection Agency in 2002. Under the new rule, both state and federal waters of the 2,900 square nautical mile sanctuary will be protected from potentially harmful vessel sewage discharge. The rule, which takes effect on December 27, also requires that vessel marine sanitation devices are secured to prevent discharges within sanctuary boundaries. Boaters can use any method that has been approved by the U.S. Coast Guard. Several private, local, state and federal entities either provide or support numerous pump-out stations throughout the region to assist boat operators in complying with this rule. Current marine sanitation treatment devices do not kill all viruses found in wastewater, nor do they remove nutrients such as phosphorous and nitrogen. This new rule prohibiting discharges and requiring the devices to be secured will help prevent these pollutants from entering the sanctuary. The sanctuary hosts dolphins, whales and manatees, three species of sharks and two different kinds of rays, as well as 14 species of fish such as groupers, snapper, angelfish and eels. Birds that inhabit the sanctuary include pelicans, herons, egrets, ospreys, roseate spoonbills and frigate birds. The threatened American crocodile and two threatened sea turtle species – the hawksbill and the loggerhead – are also seen in the sanctuary. Excessive amounts of nutrients can harm coral reef ecosystems by degrading water quality and stimulating the rapid growth of aquatic plants and algae, which in turn smother and kill live coral. 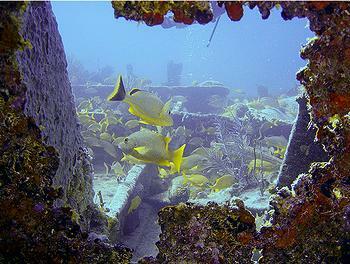 The most extensive living coral reef in the United States is adjacent to the 126 mile island chain of the Florida Keys. Extending into the sanctuary, the Florida reefs form the third largest reef system in the world after Australia’s Great Barrier Reef and the Belizian barrier reef. Coral reefs contain more varieties of life than any other marine environment. They are part of a fragile interdependent ecosystem that includes mangroves and seagrasses that grow both on the ocean and bay side of the Florida Keys. These environments are the marine equivalent of tropical rain forests in that they support high levels of biological diversity, are fragile and susceptible to damage from human activities such as the discharge of vessel sewage. NOAA’s Office of National Marine Sanctuaries received more than 1,400 written comments during a 90-day comment period for the proposed rule, which was published in the Federal Register on November 16, 2009.